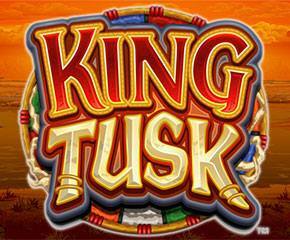 A mighty African elephant is brought into the picture with the King Tusk slot game from Microgaming. This giant beast is what the game entirely revolves around. The slot game is based in the African dusty plains wherein the entire action is taking place. Play it today at Monster Casino for real money and earn free spins. 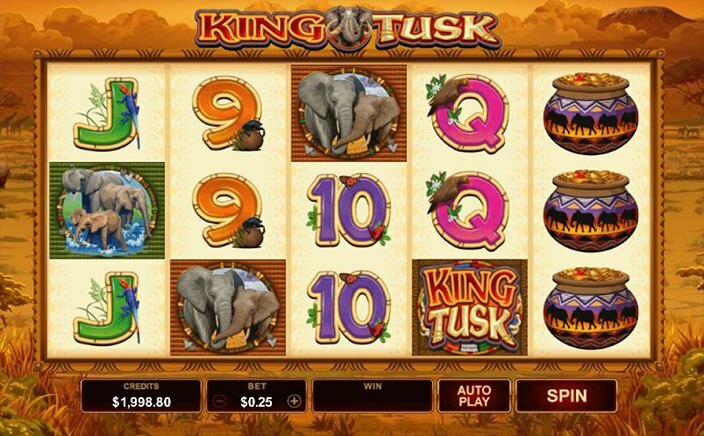 There are 5 reels, 3 rows and 25 fixed paylines in the King Tusk slot game and behind the reels, you will witness the shining sun, a landscape along with some wild creatures roaming around. The trees can also be seen in the backdrop. Setting the “Bet” will set the reels into motion and this range goes from £0.25 to £62.50. To get the reels spinning, click on the “Spin” button. You can use the “Autoplay” option to turn the reels without interruptions. The coins per line, coin value can also be set by clicking on the upper left corner of the screen. Look out for the 3 high-value symbols including 2 groups of the African beast and the other being a pot of gold. The lower values are represented by the playing card values- Nine, Ten, Jack, Queen, King and Ace. It would not take you much time to realize that the wild symbol is represented by a wild charging elephant which shall substitute for all the other symbols. The King Tusk scatter icon cannot be replaced by the wild. Elephant Stampede – On each spin, two reels will go completely wild. Elephant Dance – On each spin, a wild symbol will be added to the reels which will remain locked into place for 5 spins. Elephants Gone Wild – All the symbols which have an elephant on them are wild. A genuinely enjoyable slot game with some pretty appealing graphics and sound. Choose from the free spins mode to add more excitement to the game. Apart from these, there is another reason to try this slot which is the generous Return to the Player percentage of 97.00%.